Today’s clever little free PSD file is a simple and compact Text Editor widget. 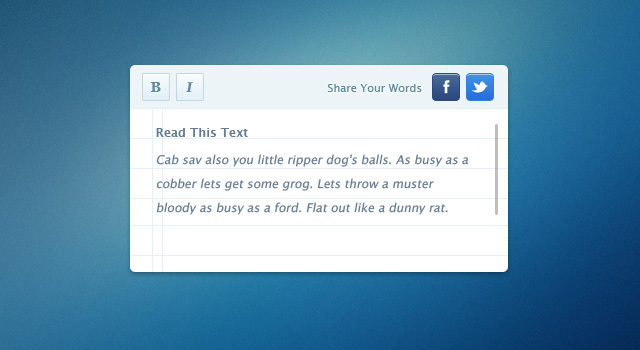 This little gem comes with social share options so you can quickly and easily share your text. Could work nice as a addition to a content management system design or admin dashboard. Simple Text editor is nice and compact…unlike my fat cat. Today’s little niffy give away is a simply transparent notifications pop up window. I really like this Simple OSX Window (PSD). Its simple to design and put together, and the possibilities for what you can use these types of windows for are endless! In this case I have just thrown a screenshot into it but you could use it for anything. Enjoy!